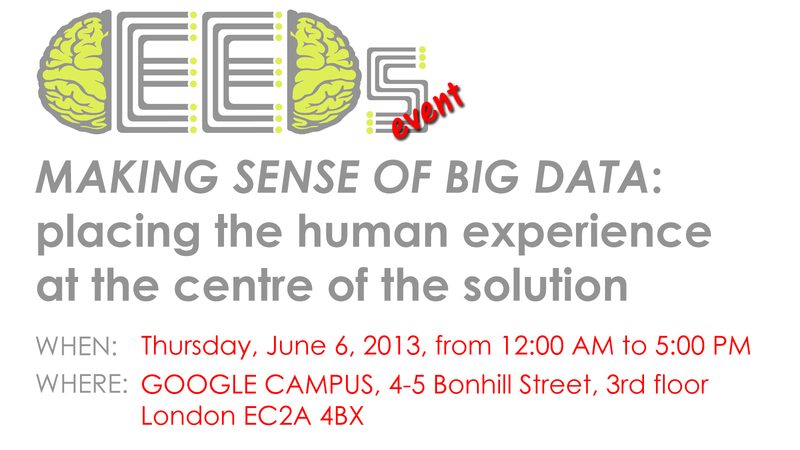 We are really excited to announce that the CEEDs project now has space booked at the Google Campus in London on June 6th for an event that will bring together universities and businesses in an open discussion around big data and the data deluge. The CEEDs project will propose a new and innovative approach to this hot topic, by bringing the human experience at the centre of the possible solution. We are very keen to hear from others who are dealing with large dataset in any discipline. Come along to discuss about your work and its challenges, with plenty of opportunities to network over a glass of wine. The CEEDs project is developing a novel synthetic reality technology that measure both implicit (unaware) and explicit (aware) user reactions to representations of a dataset, and use them to optimize data exploration, discovery and creativity. Research has shown the unconscious to play a bigger role than previously thought in understanding of complex information: only a small subset of sensory input reaches in fact conscious awareness. CEEDs aims to monitor signals of discovery or surprise in these subconscious processes, and use them to direct users to areas of potential interest and guide meaning within the dataset. Research is conducted in different scenarios and disciplines: from design to neuroscience, from retail to archeology, with applications in many more other areas. For an opportunity to show your own work or solution, please contact Eva Ferrari (e.ferrari@gold.ac.uk) to discuss your proposed topic. The event agenda will follow soon.